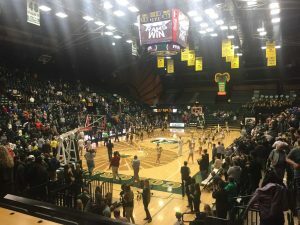 In a game in which Colorado State was favored by double digits, it never felt like it was “CSU’s game” until the waning seconds of play. Montana State didn’t start off particularly strong; and actually trailed (34-32) at halftime. Come second half, both teams really turned it on, and CSU had quite an issue to deal with. Despite only shooting 29% from three in the first half, the MSU Bobcats leaped up to a stunning 50% in the second, behind senior guard Tyler Hall. The NBA prospect finished with 30 points, and hit 10 of 20 field goals (7/16 from three) as well as 6 rebounds, 2 assists, and a steal. The Bobcats outscored their first half performance by far, totaling 42 points in the second. The Rams persisted, never letting the Bobcat lead grow too high, but also never taking the lead themselves. While the Rams maintained course, the Bobcats started to beat themselves. Totaling 15 turnovers for the match (as opposed to 7 for Colorado State), and with a good number of those turnovers late in the second half, Montana State was walking on thin ice. The straw that broke the camels back was foul trouble. With 26 personal fouls for the game (ten more than the Rams), the Bobcats put the Rams into the bonus relatively early in the second half. This foul trouble contributed to a 11-2 CSU run late, with Masinton-Bonner and Paige working efficiently from the line late. Colorado State took the game 81-77, and were saved by Niko Medved’s unwavering consistency, as the team for the most part avoided hot and cold spells altogether. Playing with a short bench, CSU definitely felt the effects of not being able to substitute their players, but the starters were able to carry the game, each totaling a double-digit amount of points. Nico Carvacho put up 15 points with 13 rebounds, and J.D. Paige totaled 23 points. A point of emphasis for the Rams for the future is improving their three-point shooting percentage, which sat at a low 20%. Next, CSU will travel to the Gulf Coast Showcase in Fort Myers, Florida beginning Monday, November 19th. For more, follow Nick on Twitter @thebakernick, and listen live to KCSU’s sports show Monday-Thursday from 7-9pm.